Rosliston Forestry Centre offers self catering accommodation near Swadlincote. The cottages in Derbyshire are in a popular woodland retreat. They provide a perfect base for exploring the local area. Our young woodland site has meadows, ponds, a fishing lake and play areas. This offers the opportunity to enjoy a range of pastimes and activities. Each lodge is made from FSC certified timber from sustainable sources. The accommodation is set in its own area of the blossoming woodland. The tastefully furnished lodges feature central heating, double glazing and flat screen TV. They are fully equipped with microwave, fridge, freezer, hob and oven. The cabins are fully accessible for people with disabilities and we have a range of special equipment available for a small hire charge. This includes travel cots, high chairs, medical beds and hoists. Cedar Lodge can accommodate 8 guests. An additional two guests can be catered for using the sofa bed in the lounge if required. Three bedrooms are available. 2 bedrooms have twin beds and the third bedroom has 2 sets of bunk beds. Up to 2 pets welcome. Oak Lodge has three bedrooms. Two are twin rooms, one has double bunks and there is also a bed sofa in the living area. Two bathrooms are available. One is suitable for persons with mobility needs. Oak Lodge offers self catering accommodation for 8 people. It is well equipped and includes a washing machine, tumble dryer, fridge, freezer, microwave and digital television. It also has an outside a barbeque and garden area. Up to 2 pets welcome. Rowan Lodge is a two-bedroom holiday lodge. The beds can either be twin single or king size doubles. The specially adapted wet room with separate toilet is wheelchair accessible. The log cabin has additional decking. Ideal for lazy days of summer relaxing and barbeques. 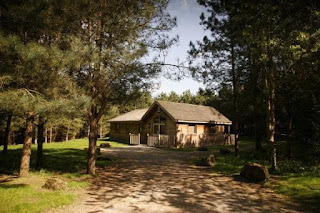 Discover Rosliston Forestry Centre. Many outdoor activities are available. Rosliston’s mix of woodland and meadow, ponds and play areas offer the perfect playground for visitors of all ages. Spot the wildlife, join a guided walk, and take advantage of a packed programme of events. Get back to nature with a short break in our forest lodges.